One choice people have to make when choosing a pet carrier is whether to buy a hard frame or soft frame model. We take a look at the Petsfit Comfort Expandable Travel Carrier and see what sets it apart from the rest. As a soft-sided and adjustable pet carrier, it’s one of the most popular on the market. There are many things to consider when buying a pet carrier. Is it the right size for your dog or cat? Can you use it for a variety of purposes? How durable and sturdy is it? Some pet owners want more security with a harder pet carrier that’s made from plastics and metal. Others want their pet to be comfortable and think that a softer product is better. The Petsfit Comfort Expandable Pet Carrier fits into this last category, but it’s still pretty durable. CLICK HERE to Read Genuine Customer Reviews & Buy it on Amazon! We’ll take a look at which size you should buy for your pet and what the added benefits are of choosing a foldable carrier. If you’re looking for a product where you can change the size and which can be carried on flights, this is certainly one to consider. Petsfit is a U.S. company that has been operating for about ten years. They have a very family, and pet-friendly approach to their business has produced a wide range of useful products over the years. They make these in their own factory, everything from innovative tubular dog kennels to chic cat houses. Their products are becoming increasingly visible online, and they are now sold around the U.S. and abroad. The Expandable Pet Carrier is one of their most popular products today. The Petsfit Expandable Pet Carrier comes in three different sizes: small, medium and large. The small is ideal for dog breeds such as Chihuahuas. The medium is more suited to dogs that are around 13 pounds. The larger pet carrier is for dogs up to 20 pounds. The porch feature allows you to double the width of the carrier in just a few seconds. For instance, the small model has a normal width of 9 inches but opens up to 17.5 with the flap down. That’s plenty of extra room for a small dog or cat. As previously mentioned, the Petsfit Pet Carrier only comes in one color – black with red piping. 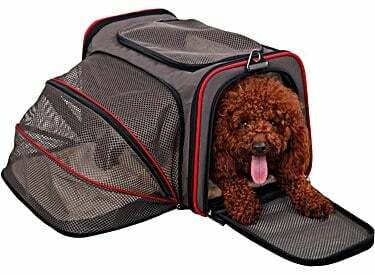 If you would prefer a hard-sided pet carrier, a very good one for travel is the Aspen Pet Pet Porter Plastic Kennel. One reason that many customers like this particular foldable pet carrier is that you can create extra space with it. You might think that this would compromise on the sturdiness, but you’d be wrong. A strong wire frame means that this a lot more durable than many other, more rigid pet carriers. Here are just some of the advantages and disadvantages you might like to consider before you buy. A unique pullout porch that folds out when you need it and can be put back just as easily is one of the big selling points of this model. It has a top opening which means you can ‘drop’ your pet in and then secure the lid. Compared to other pet carriers you get more than enough ventilation because the whole thing is made of a strong mesh that allows air to flow. You can take advantage of the sturdy handle or use a strap to carry it. It also fits most of the guidelines and stipulations for a pet carrier for airlines (though you may want to check beforehand). The soft mesh doesn’t mean it isn’t strong. The base has a lot of rigidness and comes with a washable mat for your pet. There’s a sizeable storage pocket for putting in toys and leashes as well as your stuff. You can fold the whole thing up once you have finished transporting your pet and store it away easily. This is a stylish looking pet carrier that has a lot going for it. If you’re waiting for a flight, for instance, and you want to give your pet a bit more room, you can lower the side flap so they can stretch out a bit. The top opening allows you to immediately reach your pet and comfort them if they are a little stressed. You can do this without risking their escape as happens with some front opening carriers. It’s not just suitable for long distances either. It’s a great, comfortable foldable carrier that is just perfect for going to and from the vets. If your pet has had an operation, you can open up the side porch to give them more room. While it’s suitable for most airlines, you may need to check as some have more restrictive policies and practices in place. The fact that there is only one storage pocket is a concern for some users, but this is big enough to take several items at once. If you’re looking for something that’s both functional as well as stylish and which comes in different variations, you may be disappointed. 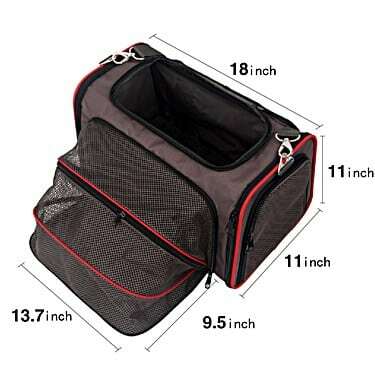 The Petsfit Foldable Pet Carrier only has one color scheme – black mesh with some red piping. If the appearance isn’t such a big issue, this really shouldn’t bother you. If you have a particularly clever cat or dog, they may be able to figure out how the zip works. It’s worth keeping an eye on them, so they don’t escape. Those with small to medium size dogs are more likely to buy this carrier. That includes breeds such as Shih Tzus, Yorkshire Terriers, Chihuahuas and bichon frizes. It’s also perfect for animals such as cats, especially if you are going on a long journey where the porch feature can make a difference to their comfort. Many people buy this as an affordable carrier for transporting to places like the vets, and they’re great for short distances. Many customers have been positive about the Foldable Pet Carrier. It’s proved very popular, particularly for those that travel regularly with their pets. The carrier seems to fit easily under seats during flights and is easy to secure when being used in a vehicle such as a car. The carrier has proved ideal for those with larger cats who are looking for a product that has a bit more leeway than other products. The addition of the side panel seems to help here, especially when traveling over a long distance. The strong handles and strap make this an easy carrier to get around with, and the firm base also keeps your pet comfortable at the same time. The fact that it can be folded away afterward also seems to be something that customers appreciate and mention quite regularly. Slightly oversized dogs that have perhaps put on a little weight but are still considered small or medium seem to fit comfortably in the larger carrier. While lifting up and taking on board a flight, for example, can be a bit more difficult, it’s not impossible. All models seem to fit easily under seats on all major airlines. The key, many customers point to, is getting your pet used to the carrier, so they don’t become stressed out on any journey. This can be achieved quite easily if you gradually introduce them to the carrier over a couple of weeks. You shouldn’t try putting your pet in the carrier if they are not used to it just prior to transportation. It’s not just for going on flights that the foldable pet carrier works. If you’re visiting the vets anytime soon, customers have found it a useful bit of kit to have in the home for emergencies. In fact, the Petsfit Foldable Pet Carrier is suitable for all sorts of journeys, long and short. While the guidelines suggest that the larger model is only suitable up to 20 lbs, some reviews say slightly bigger dogs are reasonably comfortable. Indeed, one Pug owner said that her 22 lb dog was perfectly happy in the foldable carrier on a recent flight. Whether you’re on a journey in the car or have to go to the vets, finding a comfortable carrier that your pet is going to like is essential. The Petsfit Expandable Pet Carrier has all the features and benefits you can expect from a good quality product. It also compares favorably with other pet carriers on price, while also delivering some tremendous value-added extras. Though you may be disappointed by the lack of storage space in the only pocket, this minor problem shouldn’t bother most people. The make is stylish without being too ostentatious, and the black mesh and red piping give it a certain design quality many will appreciate. 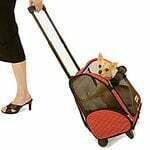 You can certainly expect your pooch or cat to be carried around in style, wherever you are heading. If you’re looking for a good budget foldable pet carrier that ticks many of the boxes, this one from Petsfit is well worth your time. 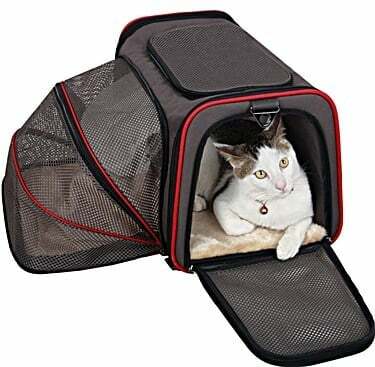 CLICK HERE to Get Your Travel Carrier on Amazon!